Hypothermia is defined as a core body temperature less than 35ºC or 95º F 1. It is usually caused by prolonged exposure to cold temperatures, but it may occur when people lie immobile on a cool surface or after very prolonged immersion in swimming-temperature water. Wet clothing and wind increase risk of hypothermia. There are many electrocardiogram (EKG) manifestations of hypothermia. It is frequently associated with the appearance of a J wave (also called an Osborne wave) and with interval prolongation (PR, QRS, QT) 2. Hypotermia can cause EKG changes that mimic ST Segment Elevation Myocardial Infarction (STEMI). Intense shivering occurs initially, which may cease as hypothermia progresses, below about 31°C 3. As the temperature drops below 31°C, patients may develop slow, shallow breathing, people do not sense the cold, Lethargy and clumsiness are followed by confusion, irritability, sometimes hallucinations, and eventually coma. Pupils may become unreactive 3. Slowing of the heart rate, initially, sinus bradycardia is followed by slow atrial fibrillation; the terminal rhythm is ventricular fibrillation or asystole 3. In humans profound hypothermia affects both depolarization and repolarization. Hypothermia is frequently associated with the appearance of a J wave (also called an Osborne wave) 2. J wave is a slow upright deflection between the end of the QRS complex and the early portion of the ST segment. They are most commonly observed in leads II, III, aVF, V5, and V6 2. They usually occur in patients with core body temperatures less than 32°C (90°F) and they increase in amplitude as the body temperature falls, as the body temperature increases, the J wave gradually becomes smaller, although there are some reports of temporary persistence of the J wave even after achievement of normothermia 1. ST segment elevation is often reported in conjunction with J waves. If it occurs anteriorly, it can resemble the Brugada pattern, and may result from Early Repolarization. The appearance of this repolarization abnormality can lead to a diagnostic dilemma as ST-elevation myocardial infarction and Brugada syndrome may have similar appearing repolarization abnormalities 2. Sinus bradycardia at 52 bpm, J waves (red arrows), ST segment elevation, PR interval and QTc interval prolongación. Hypothermia is associated with various atrial and ventricular arrhythmias. Sinus rhythm predominates, but decreased conduction velocity often causes sinus bradycardia. More than 50% of patients with moderate hypothermia develop Atrial Fibrillation with a slow ventricular response, but it usually subsided during rewarming 1 2. AV Junctional Rhythm may also occur. Premature Ventricular Complexes are common and patients may develop ventricular fibrillation. With further progression of hypothermia (<25°C or 79°F), the risk of asystole increases significantly. Increasing levels of hypothermia result in progressive prolongation of the cardiac conduction. 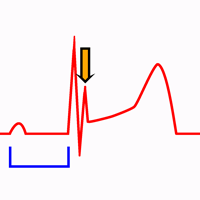 Delayed AV conduction results in prolongation of the PR interval, and various degrees of AV block may occur. Hypothermia also produces prolongation of QRS duration and a significant prolongation in QTc interval. Other EKG abnormalities seen in hypothermia include muscle tremor due to patient shiverin. From: 2010 American Heart Association Guidelines for Cardiopulmonary Resuscitation and Emergency Cardiovascular Care. Circulation. 2010;122:S829-S861 5. The first priority is to prevent further heat loss by removing wet clothing and insulating the patient. PPassive rewarming is generally adequate for patients with mild hypothermia. Layered protection with blankets, several coats or jackets, sheets or towels, is recommended. For patients with moderate hypothermia with a perfusing rhythm, active external warming techniques are appropriate (warm blankets, hot water bottles, forced-air warming system, radiant heat). Passive rewarming alone will be inadequate for these patients. Severe hypothermia is associated with marked depression of critical body functions, which may make the victim appear clinically dead during the initial assessment. Therefore, lifesaving procedures should be initiated unless the victim is obviously dead 5. The victim should be transported as soon as possible to a center where aggressive rewarming during resuscitation is possible 5. For patients with severe hypothermia with a perfusing rhythm some have reported successful rewarming with active external warming techniques. Patients with severe hypothermia and cardiac arrest can be rewarmed most rapidly with cardiopulmonary bypass. Alternative effective core rewarming techniques include warm-water lavage of the thoracic cavity and extracorporeal blood warming with partial bypass 5. Adjunctive core rewarming techniques include warmed IV or intraosseous fluids and warm humidified oxygen. Heat transfer with these measures is not rapid, and should be considered supplementary to active warming techniques. Do not delay urgent procedures such as airway management and insertion of vascular catheters. If Ventricular Tachycardia or Ventricular Fibrillation is present, defibrillation should be attempted. Multiple case reports indicate survival from accidental hypothermia even with prolonged CPR and downtimes. Thus, patients with severe accidental hypothermia and cardiac arrest may benefit from resuscitation even in cases of prolonged downtime and prolonged CPR 5. 1. Mattu A1, Brady WJ, Perron AD. Electrocardiographic manifestations of hypothermia. Am J Emerg Med. 2002 Jul;20(4):314-26. 2. Surawicz B, Knilans TK. Chou’s electrocardiography in clinical practice, 6th ed. Philadelphia: Elservier; 2008..
3. Danzl DF. Hypothermia. [Internet]. Merck Manual. 2014 [cited: 8 August 2017]. 4. Doshi HH, Giudici MC. The EKG in hypothermia and hyperthermia. N Engl J Med 2014;371:2410-6. doi: 10.1016/j.jelectrocard.2014.12.001. 5. Vanden Hoek TL, MorrisonPart LJ et al. Part 12: Cardiac Arrest in Special Situations. 2010 American Heart Association Guidelines for Cardiopulmonary Resuscitation and Emergency Cardiovascular Care. Circulation. 2010;122:S829-S861. doi: 10.1161/CIRCULATIONAHA.110.971069.